A little less humid in the AM which was most welcome and the pm run was rather late due to work. It was 7 miles in a nice easy ran. The funny part was when there was any wind it was nice and cool, but it the air was calm you could feel the heat rise off the pavement from the rain. Overall a long day at work that ended better. AM- 71/80% I have conditioned. 80% and I actually felt like I could breath for a change. However that did not affect my dead legs- tired, easy 6 miles. PM- Felt good. Got caught with a thunderstorm as I finished the run. 7.33 miles, relaxed. 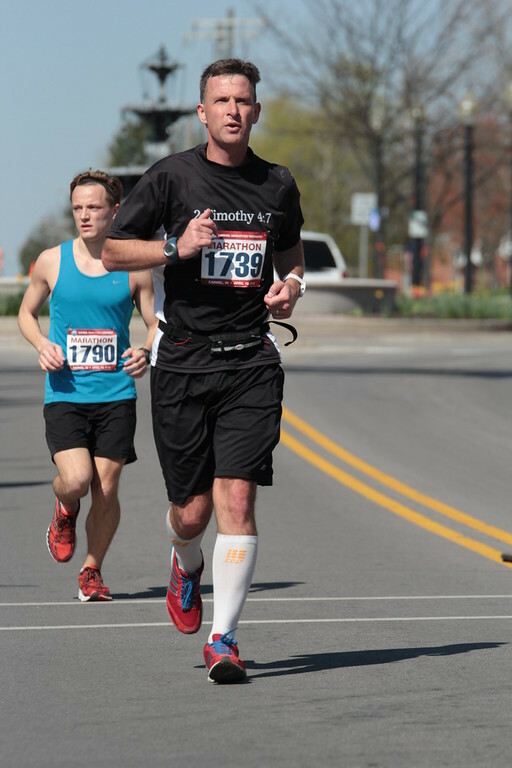 Sad update- the runner I mentioned on Saturday's race. He died with heart failure. They had a link posted on the race results website. The paper had a nice write up for him, he was only 53 though. AM- 63 :) (90% humid, but at 63, it has less of an impact) - 9.75 Mile Warm Up (because no one should do a 10 mile warm up... right Joe?) Then 6x800 Intervals w/6x400 Recoveries. Splits 7:03 (legs just would not understand what I wanted yet), 6:46, 6:45, 6:43, 6:46 (uphill, so I was happy with that and 6:36. I actually felt stronger at the end, which was a good sign. Recoveries were between 8 & 9. I thought about squeezing out one or two more, but I needed to cool down, pace my daughter for a mile and then get ready for work! Overall a good day, proud of my 10 year old for sticking with this, she plans on a 5k early fall. I told her Friday I would pace her to the Speedway and we would end with a slushy. AM- 56.... :) It felt awesome. Slow recovery run, 7 mile about 9:30/. PM - Nice weather to run in, 7 more slow, legs are tired. 8:57/ I know the cooler weather won't last forever, but it is something to look forward too that is for sure!! PM 81, relaxed 7. Legs still a bit tired, used the foam roller afterwards. 65/88%- Overall nice morning to run. It has been a pretty long week and my legs are still a little tired but I wanted to get a quality run in today. I figured if I could run 10 miles at a soft tempo around MP that would work. After 3 miles WU I did 10 like I wanted and had the legs for 2 more. I was tempted to push through and do some more, but my legs were tired and my quad and foot injuries the doc checked out seemed to be getting a bit better so I figured I better not risk aggravating them now. 15-20 Cool down - actually reset the Garmin so I would not be tempted to run hard, but I did throw in a few striders to keep my legs 'loose'.